Given the premise of this series, where human children turn into Digimon, you expect the adventure to take a greater physical toll on the kids. 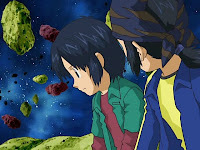 Even if the Digimon forms are the ones doing the fighting, the kids still feel the impact of every blow they take. It also raises some interesting questions about the dramatic element. One of the factors that adds significant weight to the story is that every year, one of the partner Digimon dies. Angemon, Wormmon and Leomon serve to remind us just how tragic the show can get. 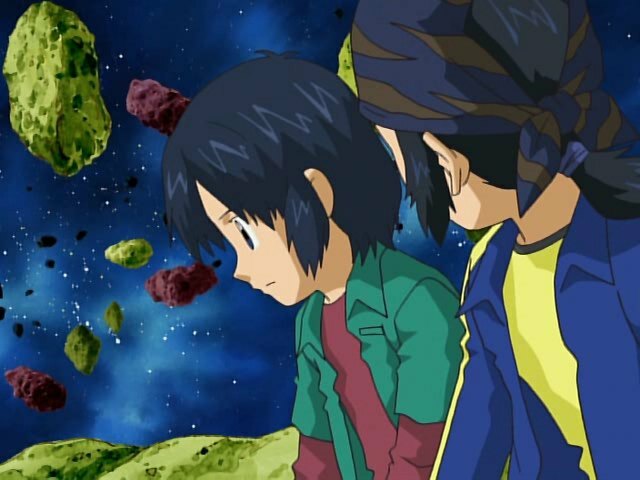 This all means that from the onset of Digimon Frontier, conditions were ripe that this would be the season that one of the children doesn't make it through. The weight of this has probably been forgotten by now, as the show's tendency to get stuck in the mud and efforts to not traumatize young viewers have subdued our awareness of how intense this must be for these kids. Even when they are injured in human form, the actual violence isn't shown and we only see them roughed up with a fractal code surrounding them. 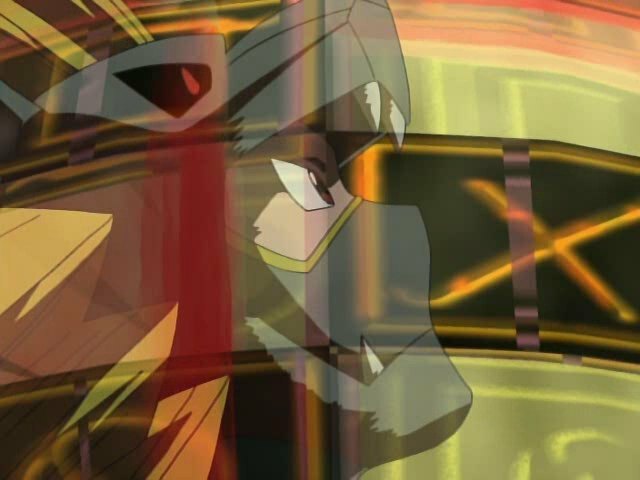 Lucemon did well to demonstrate the pain, hitting BurningGreymon and EmperorGreymon with nasty piledrivers, bringing Takuya to the point where not only is his fractal code about to be scanned, but he begins to disintegrate. On top of that, the other four scrambling to gain a foothold as the entire moon splits apart is clear evidence of the danger. That all proved to be a warning sign as Koichi sacrifices himself to prevent Lucemon from delivering a finishing blow to the other five. What makes this particular death interesting is that Koichi may have already been dead. While never stated explicitly in this episode (one of the rare times in a dubbed anime that dodging explicit references to death adds to the intrigue), Koichi has been wrestling with the implication of not having a physical form in the Digital World. The obvious question is where is his actual body, and is it still functioning? Given the nasty fall he took, Koichi is grappling with the possibility that it's not. His struggle to explain all this to Koji may have less to do with their awkward relationship than the uncertainty over his condition. What's he going to say? “Not to worry you or anything, but I think I might be dead.” If he definitely was it would be one thing, but the very real possibility of being alive in some Shibumi-style coma makes it even harder to discuss. Speaking of the other side, Crusadermon wasn't the only one eying the real world. Rather than rebuilding the Digital World according to his design, Lucemon would rather hop to the real world and ravage that. This connection between the worlds is consistent with previous episodes, which acknowledge the real world but don't necessarily interact with it. Still, there's so little depth on what exactly this connection is that it still seems a bit tacked on. Especially troublesome is how the kids, who just recently have become so comfortable with their Digimon forms that the Digital World feels like home to them, are all angrier at Lucemon's efforts at taking the real world than they were at him taking over here. Just a bit of hypocrisy there. The theme of light and darkness becoming one works very well with Lucemon as the villain. As a fallen angel, he carries with him the marks of both heaven and hell and uses them together to really lay the smackdown. 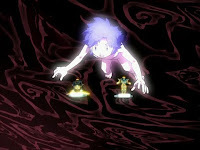 Koichi represents darkness, but commits a saintly deed, granting his spirits to Koji and inspiring a new form. Given that, it's hard to feel too bad for the way Koichi goes out. If anything, we can take great solace knowing that a boy who didn't choose to enter this world got to leave it on his own terms. Continuing with the theme of making it real, they make sure to show some of the lovable denizens on the moon base from episode 39 being completely obliterated. Lucemon refers to making order out of chaos. Who could that be an allusion to? Could it be... oh I don't know... Satan? That and the whole “using chaos to infiltrate the real world” is also very D-Reaper of him when you think about it. JP's now at the point where he's actively calling out Takuya for his persistent determination. Did Koji just subvert his promise to only call his stepmother “mom” by calling his birth mother “mother?” Sneaky sneaky! I want to give a higher grade to the episode for the Koji/Koichi talk, but ultimately Koichi never was fully able to open up to Koji. The whole “visit Mom when you get back” bit, while touching, did little more than confuse Koji. His farewell was spot-on though. Somebody explain to me why the hell these kids thought it was a good idea to engage Lucemon in their human spirit forms. I get having more than two Digimon, but Kazemon and Kumamon? You can do better than that! Look really close and you can spot the Tokyo Metropolitan Government Building (aka creepy Hypnos towers) in one of the real world shots. That means that this building has appeared in not only Tamers, but Adventure and Frontier as well. What I want to know is why Koichi giving his spirits of Darkness to Koji is enough to trigger an evolution to Susanoomon now when Koichi has been giving his spirits to Koji every single time Koji became MagnaGarurumon. Sure, it was epic that Koichi's sacrifice gave them enough power to stand a chance, but not very consistent. I'm wondering more how the heck Koichi Spirit Evolved AT ALL if he had no fractal code to begin with. Said some really beautiful things about this episode. I think I can safely say this is my absolute favorite episode in all of Frontier. I am a huge sucker for Light&Dark in perfect balance symbolism. I feel Koichi could definitely been developed better but his 'death' is one of the more touching ones of the franchise.